A new year of challenges has begun. 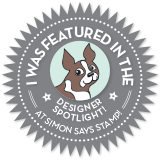 Last year my very talented mother, Wanda Hentges, and I chose to do the Simon Says Stamp Monday Challenge every week. However, many weeks were missed, more by me than her, believe me. I tended to bite off more than I could chew by doing larger projects that I just didn't have time to finish. So this year we decided on a monthly mixed media challenge. She sent me the links to a handful of possibilities and I chose the More Than Words Challenge. 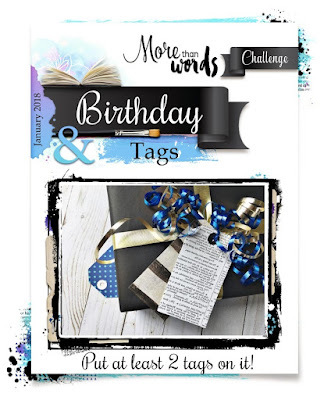 It combines a Word Inspiration along with a Creative challenge. I'm looking forward to the new year of challenges, and seeing what fun new things my mom will make outside of her usual cards, lol. The first thing that popped into my mind for the word birthday was our daughters 16th birthday, which occurred In November of 2017. I came into her life when she was just 8 years old, and very quickly became "mama", so as not to be confused with my wife "mommy". I have watched her grow into an amazing young woman, and through all the ups and downs, the good times and bad, I have and will always love her, not as my step-daughter, but as my daughter. Now that she is 16 it will bring on a whole new set of fun, and challenges. The most amusing, and smallest of which is that she has outgrown the "mama" and mommy" phase. Now we just here her holler or say "mom", and immediately have to reply "which one?" I am looking forward to the years ahead, and seeing all the amazing things I am sure she will accomplish. Wonderful spread, Kid-O!!! Great choice of pics!! Julie looks so happy!!! What a wonderful keepsake of your daughter's 16th birthday! Love it! And looking forward to seeing you and your mom's creations every month. Thanks for joining us at More Than Words!